Smartphones are awesome, but with a few notable exceptions, it seems their awesomeness is inversely correlated with their battery life. The more powerful a phone is, the faster it dies. Want a beautiful 1080p screen stretched across just five inches of slate? Most of the battery will go towards pushing those pixels. But there's a technology out there that could theoretically free us from the tedious cycle of constant recharging. Chinese electrics company TCL Communication, who owns Alcatel, is working with French company SunPartner to integrate Wysips Crystal technology into smartphone screens. This ultra-thin transparent film draws power from both natural and artificial light. It offers the convenience and renewability of solar panels without the tacky appearance. Wysips (What You See Is Photovoltaïc Surface) technology has been around for a few years now, attracting attention at CTIA 2011, but it has yet to hit store shelves in a mainstream device. Alcatel's phones and tablets sometimes look rather spiffy but don't always make it to the US. Adopting this technology could be quite the bold move. Our screens are pretty enough now, and for most of us, they already come with more than enough horsepower. We just need better ways to power them. 1st August 2013 (Aix-en-Provence, France). TCL Communication, a leading designer and manufacturer of ALCATEL ONETOUCH and TCL branded smartphones, is working with the French company Sunpartner developer of innovative energy solutions based on breakthrough technologies in solar and natural light, to integrate Wysips Crystal technology into its smartphone screens. The goal of this partnership is to develop smartphone prototypes powered by solar and artificial light. This project will enable TCL Communication to evaluate the technology in both technical and marketing terms. ALCATEL ONE TOUCH is an international, multicultural brand owned by TCL, and markets its products globally in over 120 countries. Its vision is to create smartphones around individuals lifestyles, enabling end users to do more with a full suite of handsets. Recall that Wysips (What You See Is Photovoltaïc Surface), a subsidiary of Sunpartner, has invented a revolutionary component capable of transforming any surface into a solar energy-producing medium without changing its look. 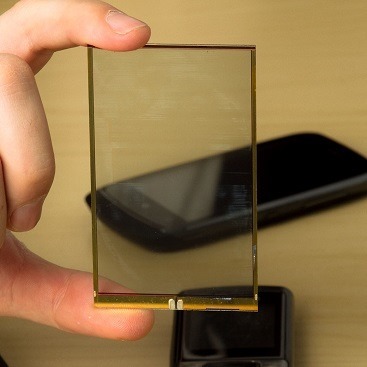 Wysips Crystal ultra-thin transparent photovoltaic layer, embedded under the screen, supplies enough energy to keep the device charged so you will not run out of power when you need to use your device. Suited to indoor or mobile applications, Wysips technology can be used for mobile phones, tablets, e-readers and other screen devices. Mobile devices consume an increasing amount of energy due to the growing number of integrated applications. Extending battery life is, therefore, taking on ever-greater importance. Wysips® has added a source of energy production without impacting the design or aesthetics of the product. 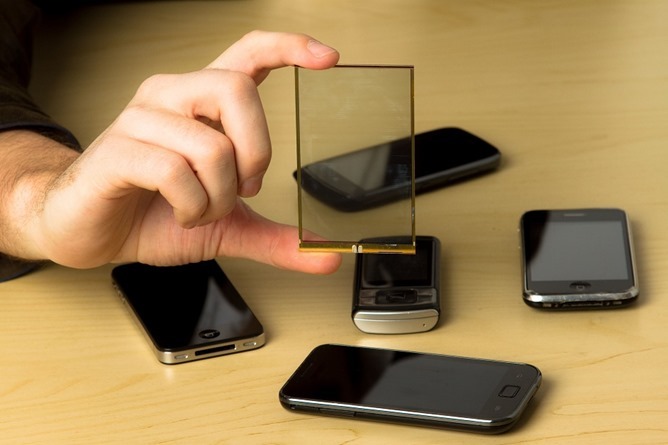 The transparent photovoltaic component is connected to an electronic chip, which converts and manages the energy produced to charge a mobile phone or tablet battery. Sunpartner is now designing prototypes for three global leaders in mobile telephony. The company plans to finalize two agreements in the coming months and sign the first licenses during the first half of 2014. Sunpartner is an engineering firm specializing in solar NETs (New Energy Technologies). It develops pioneering solutions in the field of light energy and smart surfaces and is based in France. Sunpartner’s revolutionary innovations are based on a transparent photovoltaic component that transforms any medium into an energy-generating surface. This component is developed by its subsidiary Wysips, while its independent solar energy plants based on innovative concentration technology are produced by Axiosun.